About Millet: It's Not Just for Bird Seed! About Millet: It’s More Than Bird Seed! Today I have an exciting giveaway from Bob’s Red Mill. It’s for a big box full of new grains to try. Scroll on down to enter. I collaborated with Bob’s Red Mill to bring you this post. Last month I had some fun with farro. It was one of the grains in the box that Bob’s Red Mill sent me to try. I fell in love with it and put it into all kinds of recipes. Next, I dove into the box and came up with millet. And I fell in love again! Millet may be the main ingredient in some bird seeds, but when cooked up, it’s nothing like the hard cracked stuff you’re picturing. Instead, millet is fluffy, delicate, soft. When I cooked it into a porridge, it reminded me of corn grits. But it’s way healthier. Millet is high in fiber and is an alkaline, making it easy to digest and helpful in balancing the body’s acidity. It’s also gluten-free so if you have this dietary restriction or if you’re trying to reduce gluten, millet is a great grain to consider. 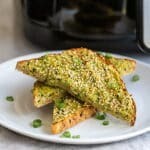 Find out more about millet from Bob’s Red Mill here and get some history and recipes for millet from thekitchn.com here. Do you want to learn more about millet and use it in some recipes? 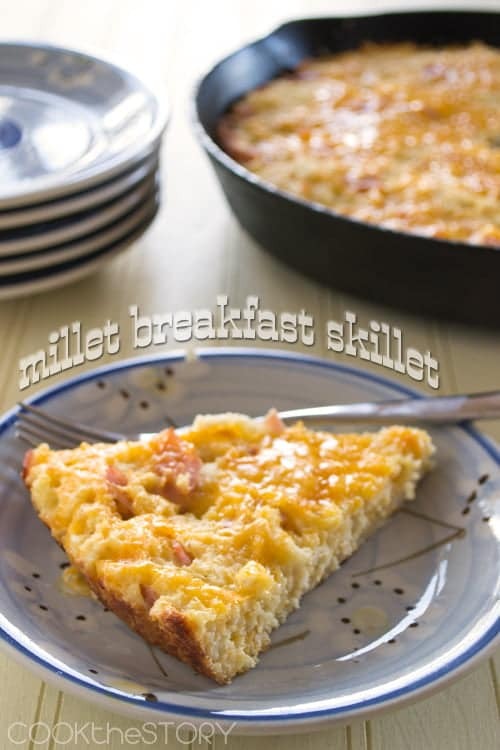 Be sure to check out my recipe for millet breakfast skillet. Disclosure: Bob’s Red Mill provided me with a box of different grains for myself to try and the box of grains for the giveaway. I have not been compensated in any other way. All opinions are my own. I have yet to try farro, but I think I’ll be using it this summer when the fresh local veggies are readily available for salads. I love grain-based salads with chopped veggies, especially fresh tomatoes and cucumbers. Anne, That sounds really delicious, fresh veggies with farro. So cool! Have you ever visited? I’d love to go and check it out some time. I love Bob’s Red Mill so very much. I have not tried farro. I would like to make a porridge with it. It makes a really fabulous porridge. Especially with a drizzle of maple syrup. Yum! Itzia, It’s really tasty in a salad. Great idea! I’ve never cooked with farro, but after reading your blog post where you cooked it with cheese and one of your children loved it, I think I’d like to try it in a quiche. I’ve made spinach, cheese and rice quiche before, so I think he farro wold be an excellent ingredient to use instead of the rice. I can’t wait to try! 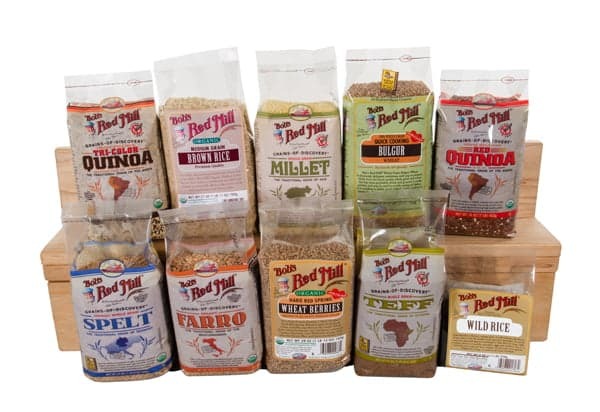 Thanks for the great giveaway, Bob’s Red Mill has some of my most favorite products, yet I didn’t know what farro was. Now I really want to try cooking with it! Tracy, So happy to have inspired you. Farro really is a great grain to try out. And I think your quiche idea would work. I also added cooked farro to a pancake batter. That was really tasty! I’ve never tried it but would love to make some hot cereal with apples and cinnamon. Katie, I think that would be delicious. I like farro a lot as a porridge. What a fantastic giveaway. I love Bob’s Red Mill products. I only tried farro once at a restaurant and it was mixed with some vegetables served as a bed for a pan seared salmon. It was lovely and I love the nutty flavor. I can’t wait to make some at home soon. Amy, The restaurant dish sounds fabulous. I want to give that a try, actually. No, I actually haven’t tried…yet! (just put this on my market list! ) thanks so much for recipe and giveaway opportunity. I have tried farro. The best time was at a vegetarian restaurant where they cooked it in a risotto-type dish. Yummy. I have not tried Farro beans before, but when I do it will be in the form of a soup heavy on the vegetables.. Very excited for this giveaway!! millet is one of my new fav kitchen staples. I like to cook a bit pot of it & use it throughout the week. No farro for me… yet. I would love to try it with roasted vegetables. I’ve never tried farro before, and now that I don’t eat gluten, I probably never will. Honestly, I am more interested in cooking with teff. I’ve never tried farro before, but I’d love to make a salad with it. I’ve never tried farro. maybe farro rissotto? Bob’s Red Mill products are great. I have been using them for quite a few years but they are expanding even more now and the whole grain selection looks wonderful. Sign me up! I’ve never even heard of farro..lol I’m so out of the loop. I’d try it alone just to see if I like it. id be willing to give it a shot. i am looking to replace corn and other not so healthy grains in my diet. I think i would start with a stir fry or maybe bake something with it. Would love to try farrow in stuffed peppers, with veggies, and wild rice. Or as a cooked breakfast cereal, with dried cranberries, raisins, and chopped nuts. I would love to try farro. I would like to “stir fry It with veggies. I make a yummy farro salad with chickpeas, parsley, pistachios and dried cranberries. YUM!!! I make farro salad frequently. I just love millet muffins, and faro salad, red mill’s almond meal makes the best flounces cakes, would just love to try more of the range, what a great prize! I have had farro in a California bowl with ahi tuna in Tampa, FL at Ciccio’s and Water. Delicious!!!!!!! Jennifer, That sounds delicious! I think it would be great with tuna for sure. 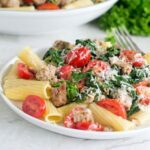 I haven’t tried farro yet, but your recipe for farro with cream cheese and spinach is on my to-try list! LOVE LOVE Love Bob’s Red Mills!! I have tried farro. Love it. Have a Pinterest board devoted to it. Especially like this salad: http://www.lifesambrosia.com/2012/11/farro-cranberry-and-goat-cheese-salad-recipe.html The only pictured grain in this blog post I haven’t tried is teff. Thank you for this giveaway. If I win I will probably gift half of it to my mom as she is in love with millet! Thanks again! If I have, I can’t remember! I think it’d work in soup…or at least, that’s what I’d try. Whenever I buy flour, beans or grains, I always choose Bob’s Read Mill products for their quality and taste. I have never tried farrow and am not sure how I would use it. I would probably prepare it the why the package says and hopefully there is a recipe included. I have never cooked with it but there is a recipe giada made on the cooking channel, i would love to try it. I bought a bag of soup mix with a variety of legumes and grains in it, and farro was in it. It was very good. Would love to see more recipes for farro!! I’ve made a farro salad with roasted mushrooms, green beans, garlic and goat cheese…amazingly GOOD. Of course, since then, I see it all the time. It’s not at all hard to find. I don’t make it often, but when I do, I usually cook it in broth. While it’s cooking, I sautee garlic, mushrooms, peppers, onions, zucchini…whatever I have in. Then I toss it with the cooked farro with a little olive oil and some lemon juice, and some fresh herbs. I would like to try a sweet potato and farro potato cake. Have never tried it before. Great giveaway! I really like the Bob Mill’s products I have used but millet I have never tried and hot cereals are my favorite. Thanks for the give away. I have tried some of Bob’s Red Mill products & I love them. I’ve never tried it but would love to try it in a pot of soup. This would be so neat as a group of ladies meet every week for a Bible Study about loosing weight. We are buying and try a new healthy food each week. How fun would this be for us to try! I’ve never had millet before but the Lemon saffron millet pilaf sounds delicious! I have tried it and loved it! I like mixing things up because it makes me more excited to cook for the hubs! I’ve never had farro before but my coworker had a recipe for a farro salad that I’d love to try! I don’t remember the ingredients right now, but it sounded really delicious! I love farro but rarely eat it due to the higher cost. When we splurge, it’s for a favorite farro salad with orange, red onion, pine nuts and olives. I tried farro for the first time at the Barney’s event last month. It was great and reminded me very much like barley! Ive never tried or used farro in anything but maybe a soup would be good? sounds awesome! I have never tried Farro, as I have to eat Gluten Free, but I would use it in soup for the husband! I’ve never cooked with Farro but after browsing through recipes online the Italian Farro, Ricotta & Orange Cake on Bob’s page sounds pretty good! I wouldn’t say I had a ton of Bob’s products but the ones I’ve had did not disappoint! I have never tried farro and I have no idea what I would begin to make with it. I need to do some research. I love trying out new grains and healthy recipes. I’ve used farro for a couple of years; I love it. I was pleased to see that Bob’s Red Mill had added it to their line. I add roasted vegetables to it–sweet potato, eggplant, onions, carrots. Next I want to try it in a kind of farro risotto. I’ve used farro in soups and grain salads, and also in place of rice in risotto. I used farro recently in a soup. I really liked the texture that it added to the soup. So far the only time I have used millet was in a muffin recipe. I am excited to try some side dishes with it. I haven’t tried it yet, but would love to toss it into a salad with a light vinaigrette – something nice and summery once the weather warms up! I have to admit I have never had farro. I bought it once, then my dog broke into the bag and ate it. He likes raw grains for some reason. Love farro salad with asparagus and feta! I’ve never tried it. I’d like to try it in a soup. I’ve never tried Farro, maybe a yummy side dish? I’ve tried farro (in soup) but I have not yet tried millet. LOVE Bob’s Red Mill items. Thanks for the chance to win. I have never tried Millet, there are a couple of others that I have not tried as well. This basket has a great selection for trying new grains. I would love to try farro. 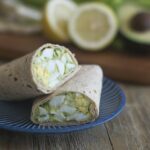 My family is diabetic and i am always looking for alternatives to rice.